On a friend’s recommendation, I purchased a Logitech Harmony universal remote. Some quick searching online suggested that the unofficial community Linux support for this device was decent. It took a bit of extra futzing around to get it working under Linux (Fedora 14 in my case), but I got there in the end. Amazingly it supports all my devices (TV, PVR, DVD, RX) despite some of them being ancient and obscure, for example a cheap and cheerful Telefunken DVD player. Plug in the remote via the provided USB cable. Visit the URL mentioned above. Skip/ignore the “you need to update your software” steps, and eventually a download prompt appears. Choosing ‘open’ rather than ‘save’ impressively results in the Congruity graphical setup up launching. Step through the setup boxes as prompted. However, in my case the remote control detection phrase failed. This was overcome by updating the concordance package from 0.21 to 0.23 and trying again. See further below for the sordid details. I was then able to select my four devices and program the Harmony remote control unit. I encountered some teething issues when attempting some tasks with the remote, e.g. the wrong AV input was selected on the TV or the DVD player wouldn’t switch off, but I pressed the ‘help’ button on the remote and it tried some things and made it work! The only thing I couldn’t get to work was changing the band (AM/FM) on the radio tuner of the AV receiver (Yamaha RX-V361). Now, provided the devices are in standby mode, it is a one touch action to have everything setup to watch TV, then another to watch a DVD and so on. This saves a lot of fiddling and lengthy explanations to visitors of how correctly set all the various remotes to watch TV, not to mention removing some clutter. It’s a shame that the Linux configuration is not smoother. Perhaps it could work better by separating out the concordance device identification data, and provide a mechanism for updating that alone, without having to recompile or rebuild the whole package. It’s also a bit unsettling that future reprogramming of the remote is dependent on Logitech’s website being operational. It feels all too inevitable that bit-rot will set in once Logitech’s priorities shift onto newer products. Nevertheless, it’s working just well enough for now. This software is distributed under the GPLv3. Interestingly, while my particular unit was marketed as a “Logitech Harmony 600 Five-In-One Universal Remote”, lsusb reports it as a Logitech Harmony 700 Remote. I bought a Harmony 650, and concordance (0.21) doesnt detect it. Now, I tend to prefer the clean solution to the easy one. In Fedora that involves building and upgrading relevant RPM packages (as opposed to downloading the tarball and doing a make install as root, which doesn’t have the traceability that RPM packaging gives). Download the concordance-0.23.tar.bz source tarball in a web browser. Change to “makerpm” user su - makerpm and copy the spec files in the SPECS directory and the tarball into the SOURCES directory. Note that I’ve missed some steps above, e.g. some variant of rpmbuild --rebuild xyz.srpm which is left as an exercise for the reader. At this point, the web configuration steps outlined earlier in the post should work, with congruity successfully detecting the Harmony remote, allowing subsequent software setup. I needed to convert a home-made video (well slide-show with soundtrack really) that was sent over from the USA. Attempting to play this on a PAL-only TV results in unwatchable flickering monochrome output. Based on some instructions for DVD format conversion I was able to convert the NTSC disc to PAL using the steps listed below. This was on a Fedora 10 system with the rpmfusion repos installed. # Note: about 1.3GB of workspace was required to generate 170MB output, in this case a short slide show with sound track. While still holding that button press and hold the AV POWER button for about 3 seconds – long enough for the DTV/CBL message to go away and the sound setting to be displayed (e.g. Music Enh. 2ch). If you don’t hold it down long enough it will say “RemoteSetup NG”. In that case, try again. If you are successful it will just display the sound setting. Enter the four-digit code using the green numeric buttons at the bottom of the remote. The code for the TV is found in the back of the AV receiver manual, which can be found online. After the fourth button is pressed the display should say “RemoteSetup OK”. The first number listed for Panasonic worked for me for an old CRT TV. The TV POWER button on the Yamaha remote should now turn on/off the TV (provided the standby button on the TV is already depressed). Other buttons should also work, e.g. TV INPUT, TV MUTE, TV CH, TV VOL, etc. Key points that are not made clear in the manual: you must use the DTV/CBL input when programming the remote to control a TV (you don’t need to have this input selected to control the TV once it is programmed though); the RemoteSetup NG/OK/display stuff as outlined above. This took me a while to get right the first time, and I neglected to write it down. Hopefully this will help someone out. My N800 was running off-line for quite a while. During this time I’d listened to a bunch of songs with Kagu and was hoping that it would immediately scrobble them to last.fm as soon as I went online. After much fiddling around, I discovered that you must play another song in Kagu while online, in order to launch scrobblerd (via dbus). This, in turn, submits all the tracks queued for scrobbling while offline via maemoscrobbler. I found some helpful maemoscrobbler tips in this #maemo IRC log. One of tonight’s tasks was to burn a freshly downloaded Fedora 10 DVD ISO image. My dad gave me some blank LightScribe DVDs a while back, so I thought I’d give them a try, not having done so before. After a quick look around it appears the only LightScribe labelling software available for Linux is proprietary. LaCie provide the software in RPM packages which is nice if you are a Fedora user like me. (Apparently they have tested it with the other major distros, which is nice to see.) It installed fine under Fedora 10 beta, which was a nice surprise given that it was apparently written for Fedora 5. It didn’t install a menu entry, but firing up the “LaCie Lightscribe Labeller”, ’4L-gui’, provided a reasonably nice experience. I grabbed some DVD media artwork from the Fedora art team. There were two labels in each image file, so I had to pick one and chop it in half with the GIMP. I then cropped it to remove the alignment patterns, and then did an autocrop to crop to the edge of the DVD label. Then it was a simple matter of importing it in the 4L-gui and selecting ‘fit image height to disc’. Writing the disc label took a bewilderingly long 15 minutes. I suppose it is effectively doing the same thing as burning a CD, but it’s a big wait for little reward. The inscribed label is a hazy monochrome image that is below the surface of the disc. In future I think I’ll just use a pen. Nevertheless, it’s interesting to the see the improvement in the quality of Linux software provided by a hardware vendor. It would be even better if they would free the code. This would enable distros to incorporate the software into the main repos, making the experience a bit more streamlined and integrated. """Return version string of installed package.""" #       typically with a var/lib/rpm directory underneath it. Note: WordPress is screwing up the markup on the code blocks above. If you have any tips on how to fix this please drop me a line. Update: Using pre/blockquote hack for now and will try out a code highlighter plug-in when I get the chance. Thanks Tim and Lindsay! According to Nokia’s Ari Jaaksi, some time ago, “There’s nothing technical that prevents it. However, the 770 is a consumer device. The challenge is that there is not much [Ogg Vorbis and Ogg Theora] content right now.“. I hope Wikipedia qualifies as “content”, not to mention personal music collections. Meanwhile, the intrepid Tuomas Kulve has released a new version of ogg-support for maemo that enables the built-in media player to play Ogg Vorbis files. He notes, “It’s untrivial to get everything working properly as the FileManager, the Metalayer Crawler, and the Media Player are all close source applications and their behaviour is not really documented anywhere.” Hopefully this situation will change. Nokia and Ogg: ambivalence or actively hostile? on Internet Tablet Talk. Download the OS2008 firmware image. The tips needed to get ssh root access working again mainly came from here. Most of my previously installed packages in OS2007 are already available for OS2008. The main ones that I am still missing are gtick (metronome) and a UPnP client. IIRC, I grabbed everything form the official maemo downloads page and this list of Working 2008 OS Software. The browser is now the mozilla-based microb browser which seems to use more memory and slightly slower than the previous Opera browser. However, it’s free software and supports newer web standards, so I’m happy with the change. There are more codecs , but still no Ogg Vorbis support, which is very disappointing. 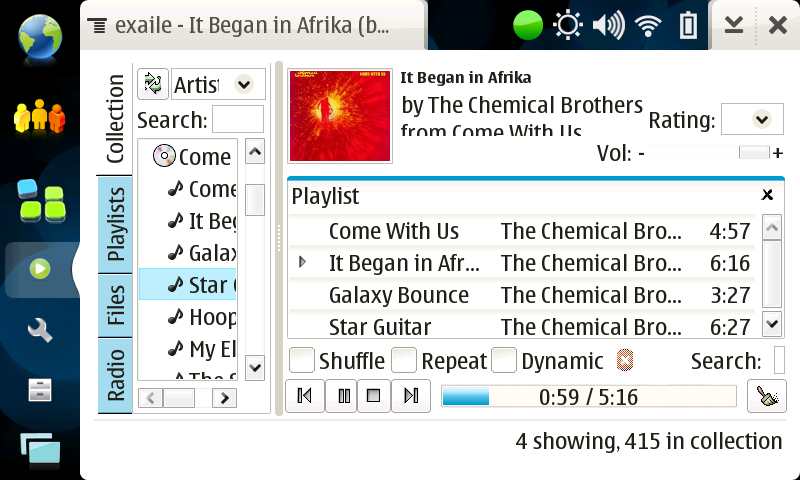 The third-party package works fine with third-party media players, but doesn’t work with the default media player. Media streaming on the ABC now works. Among other things, this means I can listen to the local radio station from anywhere, and not have to suffer crappy AM quality. Annoyingly, when playing Internet radio from the widget it keeps a message box open (“buffering”) for as long as I have it playing. I haven’t done any careful measurements of the battery life, but it seems to be about the same. This is a bonus given the increase in CPU speed. The built-in media player has been substantially improved, but without Vorbis support it’s of limited use to me. I prefer to use Kagu or Exaile. Why is there still no support for recording videos in the camera app? The problem where, if Bluetooth is disabled from the system tray, the Bluetooth icon disappears, so must be re-enabled from Control Panel, still persists. Annoying. Text prediction and automatic capitalization are off by default. The on-screen keyboard seems to be a bit over-sensitive and often registers a key twice when it was only tapped once.